NIELIT CCC Syllabus 2019: Computer Certificate Course (CCC) Exam Syllabus 2019 NIELIT Course Exam Pattern 2019 NIELIT CCC Courses Exam Latest Exam Syllabus and Pattern Download 2019. CCC Online Form is available for NIELIT CCC Exam 2019 on its Official Website. The last date of the online application form is 31st May 2019. 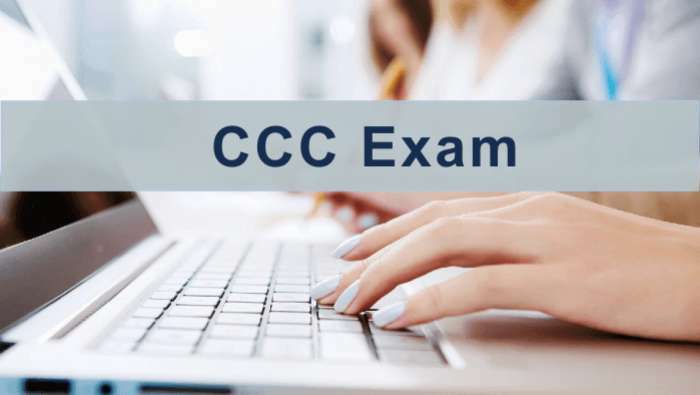 The Syllabus is available for CCC Course Exam 2019. In this article, we will provide the NIELIT CCC Syllabus details. NIELIT conducts various courses under the Digital Literacy Program under the Ministry of Electronics and Information Technology, Government of India. Some of its courses are ACC, BCC, CCC, CCC+, and ECC. All these Jobs are mandatory for different jobs essential qualification. The courses are offered by many Institutions. These exams are conducted every month commencing from 1st Saturday. Passing Certificate will be awarded to the candidate who secures minimum of 50% marks. The Course is offered as 10 days full intensive course. Computer Introduction: History of Computers, Characteristics of computer systems, basic applications of computer. Concepts of Hardware and Software: Hardware, Software, Application Software, Systems Software, Programming Language, Representation of Data/ Information, Concept of Data Processing. Basics of Operating Systems: Operating Systems, Basics of Popular Operating System (LINUX, WINDOWS). Operating System Simple Setting: Changing System Date and Time, Changing Display Properties, To add or remove a windows component, changing mouse properties, adding and removing printers, Files and Directory management, Types of Files, Summary, Model Questions and Answers. Word Processing Basics: Opening Word Processing Package, Menu Bar, Using the Help, Using the Icons below the Menu Bar. Opening and Closing of Documents: Opening Documents, Save and Save as, Page Set up, Print Preview, Printing of Documents. Text, Creation and Manipulation: Document Creation, Editing Text, Text Selection, Cut, Copy and Paste, Font and Size Selection, Alignment of Text. Formatting of the Text: Paragraph Intending, Bullets and Numbering, Changing Case. Table Manipulation: Draw Table, Changing Cell Width and Height, Alignment of Text in cell, Delete/ Insertion of Row and Column, Border and Shading, Summary, Model Questions and Answers. Manipulation of Cells: Entering Text, Number and Dates, Creating Texts, Numbers and Date Series, Editing Worksheet, Data, Inserting and Deleting Rows, Column changing, Rows, Changing Cell Height, and Width. Functions and Charts: Using Formulas, Charts, Function, Summary, Models Questions and Answers. Internet, www, and Web Browsers: Introduction and Objectives. Basics of Computer Networks: Local Area Network (LAN), Wide Area Network (WAN). Basics of E-mail: Electronic Mail, Email Addressing, Configuring Email Client. Using E-mails: Opening E-mail Client, Mailbox: Inbox and Outbox, Creating and Sending a new E-mail, Replying E-mail message, Forwarding E-mail message, Sorting and searching e-mails. Advance E-mail Features: Sending a document by e-mail, Activating spell checking, Using Address Book, Sending Soft copy as Attachment, Handling SPAM. Instant Messaging and Collaboration: Using Smiley, Internet Etiquettes, Summary, Model Questions and Answers. Basics of Application Presentation: Introduction, Objectives, Using a Powerpoint, Opening Powerpoint Presentation, Saving a Presentation. Creation Of Presentation: Creating a Presentation using a template, creating a blank presentation, entering and editing text, inserting and deleting slides in a presentation. Providing Aesthetics: Enhancing Text Presentation, Working with Color and Line Style, Adding Movie and Sound, Adding Headers and Footers. Presentation of Slides: Viewing a Presentation, Choosing a Set-Up for Presentation, Printing Slides and Handouts. Slide Show: Running a Slide Show, Transition and Slide Timings, Automating a Slide Show, Summary, Model Questions and Answers. Why Savings are Needed:Emergencies, Future needs, Large Expenses. Drawbacks of Keeping Cash at Home: Unsafe, Loss of Growth Opportunity, No Credit Eligibility. Importance of Banks: Secure Money, Earn Interest, Get Loan, Inculcate Habit of Saving, Remittances of using Cheque Demand Draft, Remittances of using Cheque Demand Draft. Banking Products: Types of Account and Deposit, Types of Loans, and Overdrafts, Filling up Cheques and Drafts. Documents for Opening Accounts: Know your Customer Care (KYC), Photo ID Proof, Address Proof, Indian Currency. Banking Service Delivery Channels: Bank Branch, ATM, Bank Mitra with Bank Micro ATM, Points of Sales, Internet Banking, National Electric Fund Transfer (NEFT), Real Time Gross Settlement (RTGS). Insurance: Necessity of Insurance, Life Insurance, and Non-Life Insurance. Various Schemes: Pradhan Mantri Jan Dhan Yojana (PMJDY). Social Security Schemes: Pradhan Mantri Suraksha Bima Yojana (PMSBY), Pradhan Mantri Jeevan Jyoti Bima Yojana (PMJJBY), Atal Pension Yojana (APY), Pradhan Mantri Mudra Yojana (PMMY), National Pension Scheme, Public Provident Fund Scheme. Bank on your Mobile: Mobile Banking, Mobile Wallets, Summary, Model Questions and Answers.